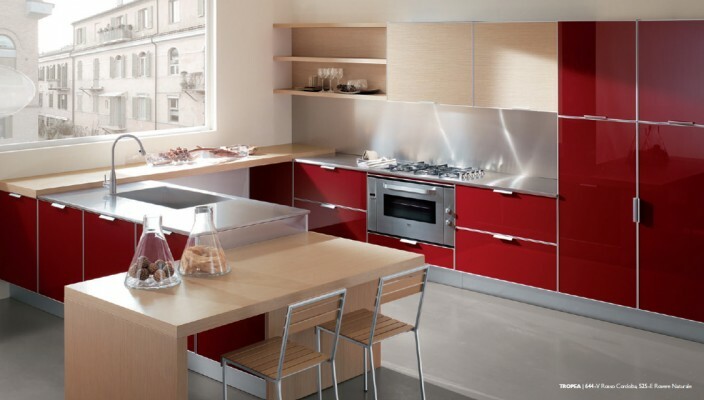 This classic concept is a new design idea that uses the color red for creating a special atmosphere in the modern kitchen for some drama! An ideal kitchen may mean different things to different people and this concept of kitchen is for people who love colors. The design gets perfect with a red finish for the cabin doors with handles of the doors in a light shade. Adding to the beauty of the red finish, the design offers space for adding a table for dining in a natural light wood shade. The light finish tabletop creates additional curiosity about the design.